Tell us about yourself: i am a lifelong gamer who plays STO daily and i try to treat other players fairly and how i would like to be treated by them. Thanks for applying to the Mighty 44th. You should receive your in-game invite next time you log in. 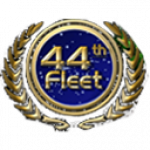 This is used to communicate with our 44th Fleet, 44th Delta Fleet and our 44th Assault Squadron (KDF) – we don’t use the in-game fleet channel. We are three fleets acting as one. We have Discord Server for voice and (extra) text messaging, and we are also on twitter.